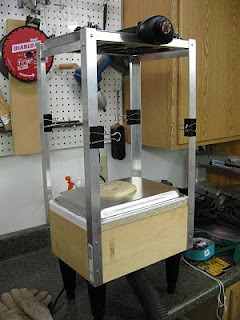 I've been working on building a vacuum former, on and off, since about November. Prior to today, it was still just a pile of parts -- it's now operational. The former is build out of Home Depot aluminum, a cookie sheet with holes drilled in it, a portable grill/crockpot thingy, and massive shop vac. It's pretty much a monstrosity. I tried to keep it small, by reducing the height of the lower box, but then ended up finding out I didn't have enough space to get the vacuum tube to turn... I then found these great adjustable legs, from a commercial range, they brought up the height a bunch, and made it easy to plug the tube in. They also add a bunch of weight to the bottom, making it quite a bit more stable. Unfortunately, you'll have to wait a bit longer to see some of the results, as I didn't get around to snapping shots of Nelson's face plate. SMALdog gets a new (printed!) head! I've been slowly getting the Makerbot tuned in, moving to using an SD card made a huge improvement in build quality, and I'm finally comfortable enough with the bot to walk away for a while. So, today I finally printed SMALdog's new head, the largest item I've printed to date, and my first >1h print. The first one looked great, but about half way through, the pile of ABS got all coiled up, I walked back in to find that the print head and Z-carriage were pulled to the top of the bot, and the ABS was hanging off the side. De-tangle, reset, chop off about 10-20ft of ABS, and tried again. 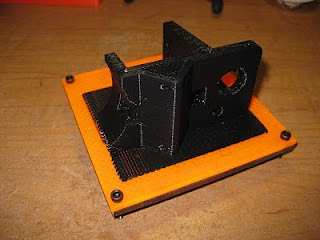 This print took 1h38m. 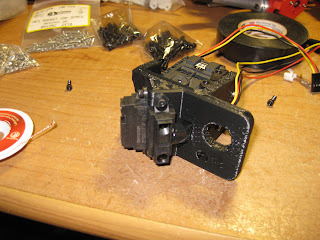 I then cleaned it up, attached the dual IR sensors, and the AX-12 servo. The 5/8" hole for the sonar sensor needed quite a bit of cleanup, but everything else was nearly perfect. 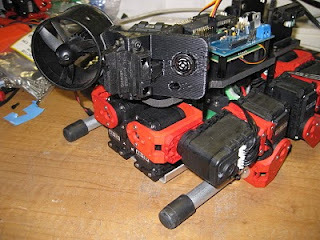 I've now got all the sensors except the IR photodiode mounted, and the head is on SMALdog.